With the power supply being one of the most important parts of a computer, you can ill afford installing a damaged or defective unit. Corrupted data, blue screens of death, and even severe system damage can result from bunk power being supplied to your computer. Now you no longer have to fear installing a faulty PSU in your computer with the Ultimate Power Supply Tester from Xoxide. The Ultimate Power Supply Tester is constructed of sturdy aluminum, and allows you to check the power from your 24-pin mainboard, 20-pin mainboard, 8-pin P8, 4-pin P4, 6-pin PCI Express, SATA, 4-pin Molex, and 4-pin FDD connections. LED indicators for the +12V, +3.3V, +5V voltage rails let you know if they are working correctly. 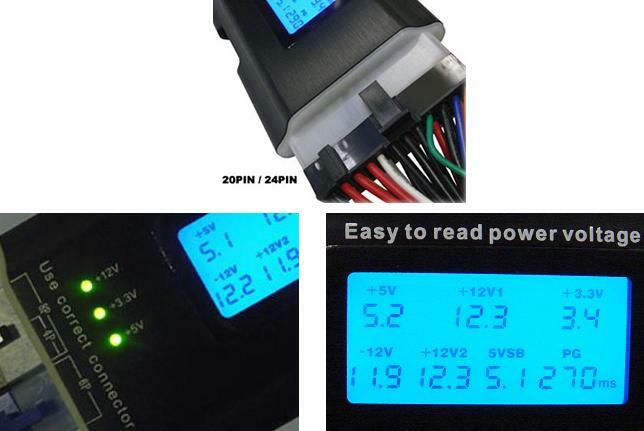 A giant easy to read LCD display delivers detailed voltage information on each of the voltage rails, and also a PG value in milliseconds! So install that power supply in your computer with confidence with the Ultimate Power Supply Tester from Xoxide. NOTE: Please refer to the power supply's specific manufacturer's tolerances for proper operating voltage range.